The past week has been an eventful one, but mightily productive for me and I will share more about that soon. 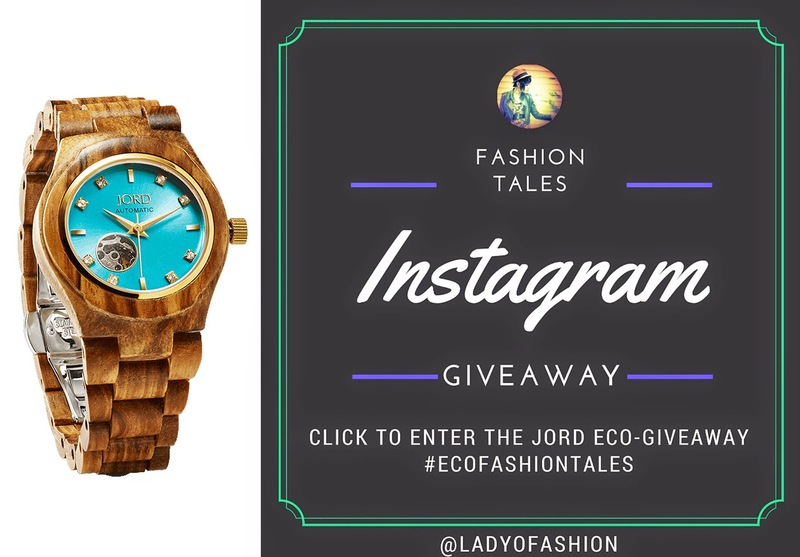 I also have a fab giveaway from the sustainable watch brand, Jord. Natural wood accessories have been very popular in the past few years, especially in home decor, interior design, and fashion. The wonderful team at Jord is backing this lovely giveaway. One lucky reader of Fashion Tales will receive a massive treat … one $120 e-gift certificate with FREE shipping! Here’s a recap of their offerings below, so do check out some of my favourite timepiece styles from them in my previous post here, or on their site, and enter below. The only mandatory thing is to leave a comment below. Enter or follow one way, or multiple ways for extra entries. It’s that simple! Buying a new watch would be a great gift for that special loved one in your life or for yourself, a Happy New Year indeed. *Special thanks to Jord for the gift card voucher and giveaway. The winner will be notified via e-mail. What a nice giveaway, Madison! I'd love to win the CORA SERIES Maple & Silver watch! The Fieldcrest in Natural Green is gorgeous! Wood watches? Now that's awesome. Love the Sidney, by the way. Oh my! What an awesome giveaway! Watches always make a lovely gift! Good luck to everyone! Is hard to choose, because they're all wonderful watches. Thanks for entering! :) Isn't the Cora gorgeous! These watches are so very unusual. I haven't seen anything like this before! I tried to leave a comment on your previous post but I wasn't able to. Just wanted to say that I loved the chalkboard theme. Those glasses with names are a wonderful idea. As for the food, it looks so appetising especially those raspberry lemon tarts. I would be delighted to be invited to a brunch like that! I have seen wood glasses but wood watch? Woooooow!!! I like that it is also gold tone! Ooh, what an awesome Giveaway, Madison! I love how organic the aesthetic of this piece is! Beautiful watches. I gave my dad a wood watch for Christmas that I found in the MOMA gift-catalog. They're so distinctive. Brunch will always be my fave meal of the day - thanks for sharing yours!!! That's an amazing giveaway, Madison. I love Fieldcrest in Maple. Thank you! Thank you! Yes, I have seen some wood inspired ones, although these are actually made from natural wood. Yes, that Cora style is a popular one! :)Thanks! What a beautiful set up! I'm drawn to those blue plates and chalk board glasses. Oh wow, what a unique brand and the pieces that are featured here looks stunning! Great giveaway, is it open to everyone? I love the Ely Watch in Cherry from the Woman's section. The cherry is a beautiful color. I also like how the faceplate matches it. What an amazing brunch.It looks like the perfect way to start the year. those are so gorgeous! i'd love to win one. I have seen wood styles watches once before and absolutely loved the concept. These watches look so cute especially because of their colorful faces. I don't usually like watches (especially new ones, as I tend to favour older or vintage ones). However, these wooden straps are aesthetically VERY pleasing indeed. I do like the sleek simplicity in the design of the watch faces too. Wonderful giveaway! Love them all :-) count me in. Thank you! :) Great selection! Yes, the wooden styles are very unique and different. Thanks Roz! I love the Ely style in maple or black! WOOOOOOW!!! Thank you so much!!! Congratulations! An e-mail has already been sent to you this morning to confirm. Thanks!